If you are looking for a laptop that you can carry it to wherever you want, then this Acer Aspire V5-122P is your ideal choice. Its smooth rounded corners maximize the comfort of carrying. Less than 1″ slim and just over 3 lbs, this thin & light touch notebook is super easy to carry. In addition, it comes with 3-cell battery which fits flush into the chassis, providing up to 3.5 hours of cord-free battery life on a single charge. There is an optional second battery to let you extend battery life up to 6 hours, ensuring all your daily tasks are accomplished without having to recharge. Featuring a stunning 11.6″ HD LCD 10-point multi-touch display, this Acer Aspire V5-122P-0600 maximizes the efficiency of your hands- you can browse online and breeze through photo albums as you open programs and complete tasks without using anything but your fingers. The smooth, intuitive, and designed Windows 8 let you spend less time searching and more time doing. You can get access to your people, apps, sites and more easily and quickly. 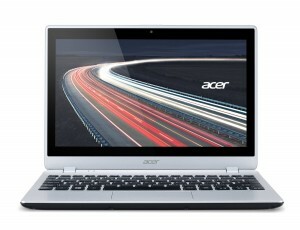 Don’t be fooled by the compact size of Acer Aspire V5-122P, it has full-size features. Equipped with 100% standard-size keyboard with bigger keys for more accurate typing, this unit ensures high working efficiency. The Backlit Keyboard, another great bonus, making it possible to type freely in dimly lit areas.